Hello! My name is Bella'Mar and i just turned 10 in December! I began riding when i was 7 years old in Connecticut and just fell in love with horses! When i was 8 1/2 our family moved to Milton, GA and i joined a local barn and began competing in Hunter Jumper. I have a pony named Jackson, "aka Napoleon Dynamite" who is 5 years old and a Silver Dapple Welsh. I invented the TackSaver™ in 2016 because I used to use a rag or sponge to clean my tack, but didn't like getting my fingers icky and sticky. You will love it. TackSaver™ is soft and comes in all the beautiful colors. Order one in every color and enjoy it for your tack and horses . 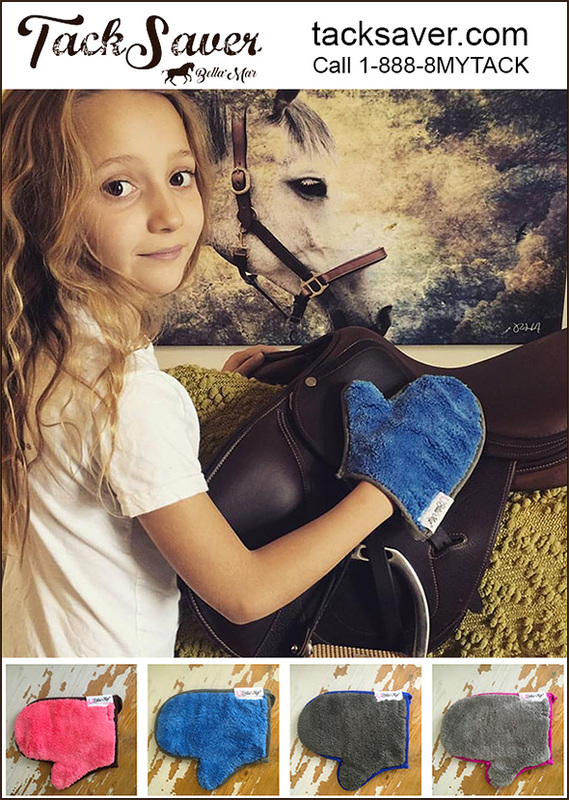 TackSaver™ was born in 2016 when a special little 9 year old girl (& mini'entrepreneur) Bella'Mar decided that there had to be a better way to keep her tack clean & conditioned. Bella just wasn't satisfied with her "sticky icky hands" from the usual leather cleaner and sponge method! TackSaver launched in 2016 in Milton, GA & offers a great alternative to sponges or cloths and will help to keep your tack in super condition- lint free! Bella's parents and 4 siblings help her in her business and are excited to see it grow! What Can I Use My TackSaver For? Once you get it, you will see that TackSaver can have endless uses. Here are just a few! * Mom loves it to clean her countertops, stainless steel and computer screen/keyboards. * The mitt wraps perfectly around the bridle and reins for easier cleaning! Can I Machine Wash My TackSaver™ ? Yes!! TackSavers are machine washable and dryable when you are using a spray leather cleaner, fly spray, furniture polish. If you are using a thick lanolin based tack conditioner only mineral spirits will lift the lanolin. It can be soaked in mineral spirits and then hand washed with dish soap. But remember not to was your mitt too often! As the oils build up it will make your saddle even more shiny! Note: We recommend having one TackSaver to remove the dirt and grime and another to condition. What About A TackSaver™ For Bathing My Horse? Just email today and we’ll make sure you get a TackSaver perfect for washing your horse. You’ll love the way it gently cleans and holds the soap and your horse will love the way it feels! What If I Want To Carry TackSaver™ In My Shop Or Order Several For Boarders Or Students? What a GREAT idea! TackSaver is the perfect gift— every one loves them— and they are affordable. Just email or call and we’ll get you special pricing! Call To Order Your TackSaver™ Today! At only $10, every barn should have one. Order TackSaver™ for your horse friends so they can have one too. TackSaver is the special design, and creation of Bella ‘Mar, who is a girl with a dream of doing business in the horse world she loves. Multiple colors to choose from, you’ll want to order them call. Make sure you order today!